Three CVR runners had good races in Boston on Monday. Nick Persampieri ran 3:26:47 in his first Boston. 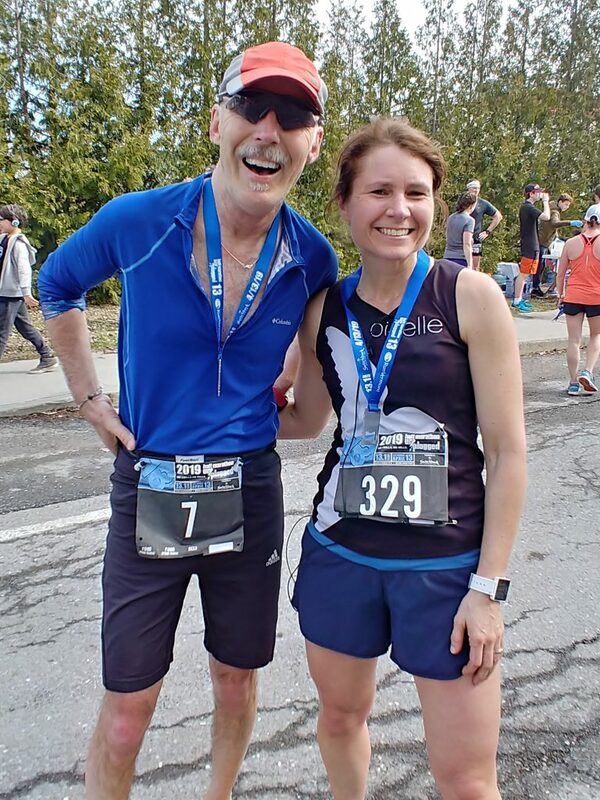 Boston veterans Sandy Colvin (3:56:54) and Phil Krajewski (3:46:52) both had solid races (Phil was 11th in AG). All of these meet the qualifying standard for next year, although in Sandy’s AG it took a 3:55:08 to actually get in the race for 2019. Searchable results here. Lots of CVR runners at the warm and muggy Unplugged Half Marathonon Saturday. Some notable performances: Wave 1: Allie Nerenberg (8th F 1:33:32) and Richarda Ericson (11th F 1:35:26). George Aitken was 3rd overall in his first Unplugged in 1:20:19. Chris Andresen would have been 2nd 60-69 AG (if there were AG awards) in 1:39:25. The smaller (and even warmer) Wave 2 saw Dot Martin 9th F in 1:41:51. Wave 1 results here. This past weekend saw CVR runners on the trails too. 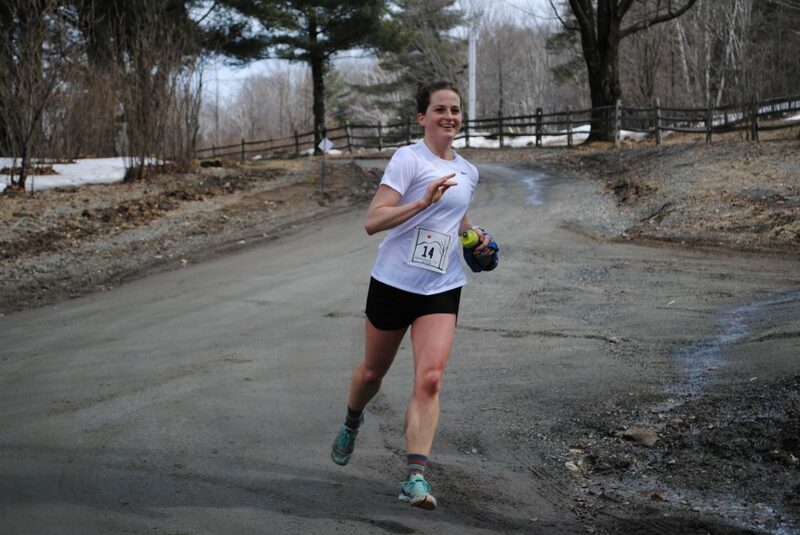 At the Runamok 50K in Pomfret, Dylan Broderick was second female in a time of 4:19:10.April Farnham ran her first 50K in a time of 5:43:03 and go the award for the “fastest first time female”. Congratulations to both! The next Race Series race is the 45th Annual Paul Mailman Ten Miler on Saturday, April 27. The companion 5K race is not part of the Race Series but is at the same time and on the same course. Early discount registration is still available. The next day, on Sunday the 28th, is the 23rd Annual Mutt Strutt at Little River State Park. Nice scenic 3 mile course on a closed road. Bring your leashed dog, or you can run solo without a dog. Awards based on dog size/owner gender/age. With two races in two days, plenty of opportunity to get your Race Series volunteering done. Both races need help, contact Andy Shuford for the Ten Miler (Saturday) or Manny Sainz for the Mutt Strutt (Sunday) if you can help. The last Winter Long Run is this Saturday at 9:30am and will be hosted byBob and Sue Emmons. The venue will be the Green Mountain Coffee Visitor Center at the Waterbury train station. The next newsletter will go out before the May Meeting (May 13). Start working on articles now and have them to Maryke Gillis no later than May 4. The annual tradition of greening up the Fun Run course will occur on Thursday, May 2. Meet at the Fun Run start at 5:30pm (behind VT Dept. of Labor on Green Mountain Dr.). Mack Gardner-Morse will be in charge and will have some bags and gloves, but you may want to bring your own. If you want to come early, Mack will be there early and will stay at the start until at least 6pm if you can’t get there at 5:30pm. This year’s green up is in honor of Scott Skinner who passed away last year and was a frequent participant. Here is a thank you note from the Craftsbury Girls on the Run team for our recent donation to their program. CVR Fun Run Unofficial runs on Tuesday at 5:30pm, official runs return May. Location: Montpelier Rec Path behind the VT Dept. of Labor on Green Mountain Dr.
April 27, Rollin Irish Half Marathon, Essex, 9am. May 16, Vermont Corporate Cup and State Agency Race 5k, 6pm. *June 8, Capital City Stampede 10K, 9am, Onion River Outdoors on Langdon St.
It’s a good idea to check the race information on the race website as dates and times can change. Feel free to email me any additional events that should be listed here.